The government had conducted the “Yojna Banao Abhiyan” with a lot of publicity in 2015-16. The workers and Gram Panchayats had chosen about 10 lakh works to implement in their panchayats. Instead of taking these into consideration, the state government has imposed schemes of their choice on the people. Along with that they have violated the NREG Act and undermined the Panchayati Raj system by forming Adivasi and Gram Vikas samitis. The BJP government has made tall claims about about the economic development in the state and the country but has not increased the wages of the NREGA workers even by a rupee this year. 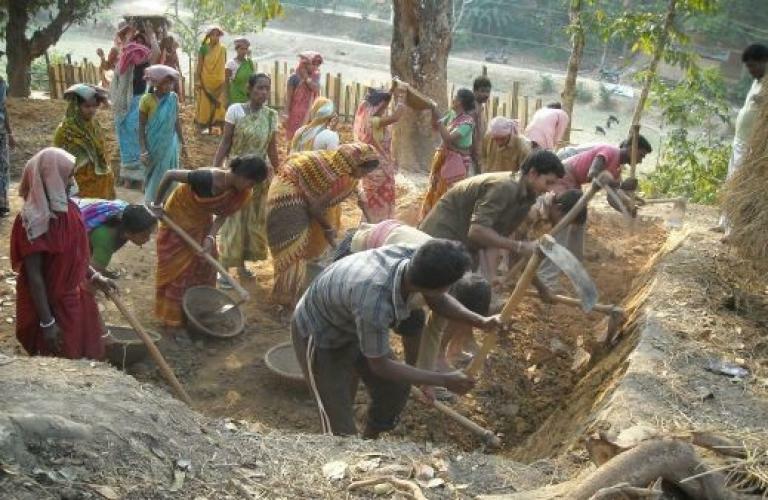 In Jharkhand the NREGA wages are Rs 71 less than the minimum wages. Working at such meager wages is akin to bonded labour. Workers’ wages have been stopped several times this year due to paucity of funds. The workers constantly suffer due to administrative bottlenecks of the government. The attitude of the Jharkhand government is clearly reflected in the fact that the State Employment Guarantee Council, of which the Chief Minister is the head, has met only once in the last 4 years. There has been no action against the officials held responsible for violating the rights of the workers as per the social audit reports. And the position of the Lokpal is vacant in 19 districts. Further, 40 percent of the posts of NREGA personnel are vacant.